마이크로소프트 창업자 빌 게이츠가 한국과 공동으로 추진 중인 친환경적이면서 경제적인 차세대 원자로 개발에 관해 박근혜 대통령과 월요일날 의견을 나누었다. 청와대에서 만남을 가진 박 대통령은 ‘소프트웨어 황제’에게 경의를 표했다. 빌 게이츠의 한국 방문은 한국원자력연구소와 차세대 원자로 개발을 공동 개발할 의도가 있었기에 많은 관심을 받았다. 양측은 지난해 8월부터 인류의 에너지 문제 해결을 위해 원자력에너지 문제의 중요성에 곰감하고 원자력의 경쟁력을 높이기 위한 제4세대 원전 개발을 추진해왔다. 빌 게이츠는 또한 빈곤한 국가에서 국제적 도움을 받아 발전한 한국은 그 경험을 어떻게 다시 환원할 것인지에 대한 고민도 필요하다고 언급했다. 빌 게이츠는 한국 방문 기간 동안 카이스트 대학의 원자력 및 양자공학 교수이자 대통력직인수위원회 교육과학분과 위원으로 참여했던 장순흥 교수와 만나 4세대 원자로 개발의 공동추진 방안을 논의했다. 장 교수는 기자와의 통화에서 “4세대 원자로 개발을 추진 중인 한국원자력연구원과 테라파워가 원형로(프로토타입)을 공동 개발하는 방안을 놓고 향후 3개월 정도 타당성을 집중 검토한 뒤 최종 결론을 내리기로 했다”고 말했다. 월요일 오후 서울대 근대법학교육 100주년기념관에서 열린 강연에서 빈곤한 나라에 낮은 비용으로 에너지를 공급하기 위해서는 원자력 등 새로운 에너지 기술개발이 필수적이라고 말하기도 했다. 박근혜 정부가 추진하는 “창조경제”에 대해서는 단순사용과 모방을 넘어선 진정한 창의성에 도달하기 위해서는 기초적인 지식을 연마하는 것이 중요하다고 답변했다. 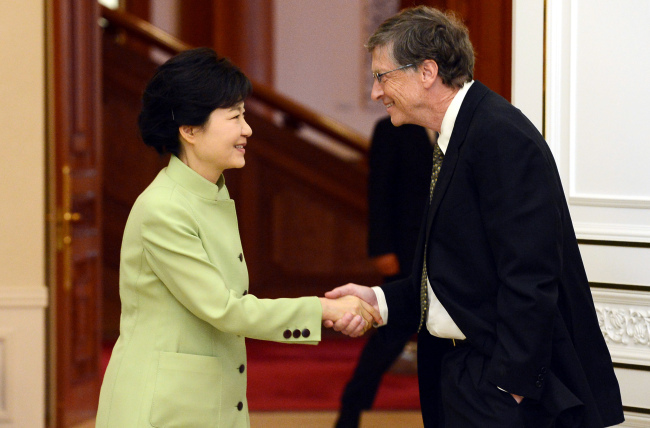 President Park Geun-hye and visiting Microsoft founder Bill Gates met on Monday and shared views on Korea’s drive for creative economy and ways to cooperate in developing a next-generation nuclear reactor and alternative energy sources. Gates’ visit to Seoul received attention as he indicated an intention to co-develop a next-generation nuclear reactor with South Korea’s Korea Atomic Energy Research Institute. Some news reports also paid attention to Gates’ focus on alternative energy development, saying his stance may help add weight to the Seoul government’s pending nuclear energy agreement renegotiation with Washington. The two governments are currently at odds over Korea’s demand to reprocess spent fuel rods to fight a growing nuclear waste problem. During a speech session held at the National Assembly earlier in the day, Gates responded that desirable results should come out and that nuclear energy must play its role to a question whether he could help the Korea-U.S. negotiation move forward. Stressing that the volume of waste can be reduced in fourth-generation nuclear reactor, Gates was also quoted as saying that it was equally important to create energy that does not emanate carbon dioxide as it was important to supply energy at low cost. Gates also mentioned Korea’s growth from a recipient of international aid to a donor and to use it as an experience to consider how to contribute to the world. It has been several years since the superenterpreneur lunged into the field of nuclear energy by leading an eco-friendly and economical next-generation nuclear technology drive through his company TerraPower. During his visit here, Gates expanded his idea by reportedly agreeing to review joining hands with South Korean experts in developing the fourth-generation reactor in a meeting with professor Chang Soon-heung, a professor of nuclear quantum engineering at Korea Advanced Institute of Science and Technology and a leading authority in nuclear study who had been a part of Park’s transition team. Chang was quoted as saying in news reports that the KAERI and TerraPower will review the feasibility of ways to jointly develop a prototype reactor for the next three months before making the final decision. Gates was expected to explain such a plan to Park in their visit and ask for the Seoul government’s support. During his speech at the Seoul National University on Sunday, Gates stressed the need for alternative energy, saying that nuclear reactor energy is not the only alternative as it entails safety and waste problems and that a new innovation is required. As for his thoughts on what the Korean version of creative economy should be, Gates emphasized the importance of fostering elementary knowledge in order to achieve creativeness beyond imitation. The same day, Gates visited executives of Samsung Group and shared views on IT-related issues. Gates was quoted as saying that he had a useful discussion on cooperation between Samsung and Microsoft.